Earlier this week, we celebrated our daughter’s 1st heavenly birthday. The time following pregnancy loss, specifically when you had seen your baby on an ultrasound, who’s heartbeat you heard and cherished, and who’s presence you shared with loves ones aren’t easy. And, you don’t move on from the physical pain and emotional & spiritual suffering, as quickly many people think or assume you do or should. Your entire world is now operating from this point of reference. You’re carrying this burden around with you that is unseen by the world at large. You think about it daily, especially during the time when your body is recovering from the trauma it has been through. It’s a daily reminder that your child is now gone. I have a friend who’s baby was born about 10 days before my miscarriage. I was due to bring them a meal and meet the baby (and was planning to tell them about our pregnancy). That was the first big hurdle that was in front of me. The thought of seeing that newborn and having to tell them of my own loss was too much for me at that time. This middle part of Lent is always the hardest for me. The strong convictions with which I started on Ash Wednesday have begun to wane. The new routine of prayer that I’ve tried to establish has been interrupted and intruded upon by my family, my work and my life; I’ve slipped up at least once in my fasting. I start to wonder if it’s worth it—whether or not I should stick with the resolutions I made at the beginning of the season. I feel guilty for the ways in which I’ve failed to answer the call to prayer, fasting, and almsgiving, and I try to convince myself that it’s okay. After all, I’m a good person, I’m loving to my family (most of the time), I give what I can when I remember to, and I’ve already prayed more than most other people have. The Scripture reading for today (Thursday for the 3rd Week of Lent) seems perfectly tailored for my Lenten halftime slump. It’s a reminder of an uncomfortable reality—one that is disturbing for many of us today. We are often not comfortable with talk about demons or the devil. Many Catholics believe that the devil is a sort of cosmic balancing power or a theoretical being. The devil has the advantage over us in that he is an invisible powerful spirit. One of his greatest tricks is convincing so many of us that he doesn’t even exist, a truly clever tactic. 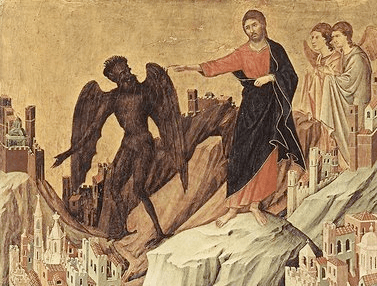 The incident with the demon in today’s gospel prompts a debate between Jesus and the crowd that discusses the forces of evil with disturbing levels of detail: naming demons and even discussing the strengths and weaknesses of the devil’s plan of attack against humanity. Today’s gospel reading helps me acknowledge where my fading desire and conviction at this point in the Lenten season come from. Jesus’ reminder that the devil and his demons are very real beings that pose a very real threat help me to recognize my temptations to laziness, de-motivation, and lowering of standards for what they are: attacks from evil against the strides toward holiness that my Lenten resolutions are gaining. The devil is real—and he certainly does not want me to unite myself with the passion and suffering of the Cross, to improve my relationship with God through increased prayer, to weed out my tendencies toward sin through fasting, or to magnify God’s Love in almsgiving. I know who is going to win this fight...but what about when Jesus tags me in? The gospel for today also brings me comfort with Jesus’ reminder that he is stronger than the devil and that if I stand with him, I can overcome any attack. So, instead of lowering my standards and accepting less, I’m going to try to step up my prayer an extra notch during this time of weakness and ask Christ who still has power over demons (and his angels) to help me be strong in the face of temptation so that I can continue to grow in holiness this Lent. How well have you been living your Lenten commitment? In what ways have you been tempted to abandon or modify the challenges you set at the beginning of Lent? How do you recognize the attack of demons, the devil, or evil in your journey to holiness?